For the racing scenes alone the new HBO show 'Luck' is worth watching. There was a scene on opening night's episode when an Irish female jockey played by Kerry Condon was exercising a hot young horse for veteran horse trainer Nick Nolte. The up close of horse and jockey was far better than anything the recent movie about Secretariat or the recent Seabiscuit' film. There were also several racing scenes showing in full flower, the magnificent acceleration of the modern thoroughbred. It also showed the sheer daring of the jockeys, riding essentially unprotected, on an animal going close to 40 miles an hour. The scene where a horse suffers a fatal breakdown was also beautifully filmed as we watched his dying breaths as the vet plunged the euthanizer into him and his eyes softly closed then froze in the open position. The other star so far has been Santa Anita racetrack, one of the most beautiful tracks in the world. The early morning gallop scene with the cold air visible with every breath was a wonderful scene. The first episode featured four racetrack rats who finally strike it lucky with the pick six. Be careful what you wish for might be their motto as we can see their ordered if dishevelled lives are about to change for ever. It also featured the sly trainer Escalanate who will clearly play a much bigger role in the series. The Dustin Hoofman character, Ace Bernstien, did not come into sharp relief in the first episode but judging by the trailer for future episodes he will be very much front and center. Hoffmann in any role is always a pleasure. 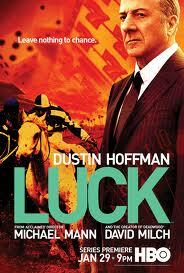 There was much to like about 'Luck' which HBO has been promoting widely over the past few weeks. I think they may have a winner.